So thrilled were we to receive a couple of photographs of this wonderful wedding in London this December. 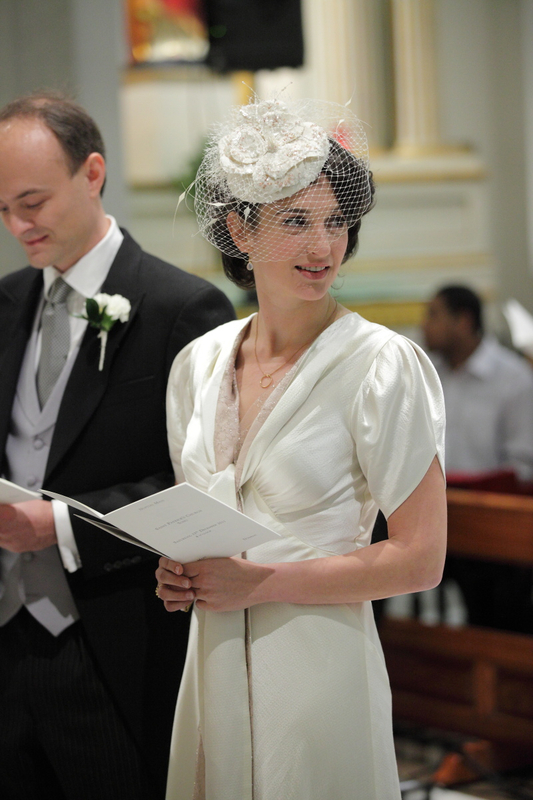 Mary, our gorgeous London bride was styled perfectly with a sprinkling of vintage charm. The brief was for an understated chic wedding dress, …which didn’t look too weddingy, for a winter city church wedding and reception in London. The understated 1940’s inspired wedding dress, the Astor was chosen from our collection of ‘less formal wedding dresses’ because of its timeless appeal and vintage spirit. The Astor would be a beautiful piece which could perhaps be worn again,…and most certainly be treasured for years to come. We styled the dress for this occasion with a vintage fur wrap which we lined in silk satin to match the fluid scarf like ties on the dress, and then commissioned the most fabulous milliner Edwina Ibbotsen who we work with on couture and bespoke pieces to make Mary one of her fabulous pillbox hats which had birdcage veiling. The millinery was a piece of art in itself, a beautiful lace covered pill box which was then custom hand beaded in rose gold bugle beads to subtely tie in with the rosey peach tones in the silk trim of the Astor and the most beautiful pair of Rupert Sanderson rose gold leather sandals which we had suggested to complete the look. one would normally perhaps expect were certainly there. Mary chose Nadira Persuad, who is a celebrity make up artist which we recommended on this occasion. Nad has the ability to create more ‘red carpet’ looks and relevant understated fashion looks for our brides that would perhaps want to be a little more styled.